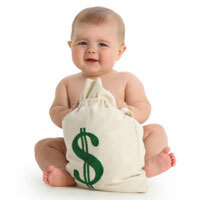 Little bundle of joy =’s a little bundle of cash! As to be expected, Mr. Salam’s article generated a fair amount of heated comments. As a “nonparent”, I certainly take issue with the expectation that I shoulder extra financial burden for another’s perceived “simple injustice”. While it is easy to become indignant at such a radical suggestion, my logic for taking issue with Mr. Salam’s suggestions fall under three simple rationales. While the monetary amounts of these benefits is debatable, what is not debatable is parents already enjoy tax breaks simply for having children. These are benefits nonparents cannot qualify for. Anyone who pays taxes pays into the infrastructure that nurtures America’s children. Whether through property taxes or sales taxes, a percentage of these taxes are levied for schools and educational purposes. In addition, many of the “free” child-related recreational activities (like youth baseball, softball, football, etc.) offered by cities are supplemented by these same taxes. Once again, the monetary amounts of these taxes is debatable. However, what cannot be debated is the fact that a percentage of taxes are already utilized for children-related educational and recreational means. These taxes are levied uniformly and do not distinguish between nonparents and parents. Therefore, nonparents already monetarily “nurture” America’s children. Of my “simple” rationales, this one is the trickiest. Unlike my other two points of contention which contain objective facts and figures, this point is significantly more subjective. Like Mr. Salam, I believe a parent deserves commendation for bearing and nurturing our future generations. Parenting is not easy and often it can be a thankless role. However, I also believe that parenting is both a responsibility and an investment. A parent has a personal and social responsibility to ensure they have an adequate financial means to bear and nurture their children. Like any investment, if one does not have adequate financial means to invest…well…they should not invest! I understand that the numerous variables involved in child/family planning makes it practically impossible to narrow down an exact timeframe. However, like any big life choice, having children should be something that is planned for to one’s best ability. This includes the financial discipline necessary to adequately provide for one’s children. If one does not, or cannot, maintain that financial discipline, or is unwilling or unable to plan appropriately, then they should not have children! Once again, the monetary figure that Mr. Salam quotes is debatable. However, most would agree that the cost of everything is rising. If so, then it stands to reason the cost of raising children is also becoming more expensive. While Mr. Salam advocates a tax break for parents, I believe there should come a point where parents should have to pay more taxes…or at least lose their tax breaks, depending on the number of children they have. What that “magic” number is…3..4…7 children? I don’t know. The reality is there is a finite number of resources available. These resources, necessary for survival, are becoming increasingly scarce. The other reality is there is no longer a need for a “large” family unit in today’s America. Those that choose to rear large families do so for reasons that benefit only them. These reasons include personal satisfaction, family expectations, or religious beliefs. This comes at the expense of others that are vying for the same finite, increasingly scarce resources. This makes those that rear large family units selfish. As a result, they should be taxed more…and not less.